A blog reader sent me this picture a few days ago, and I'm finally getting around to posting it here. It's not related to the Stars, but it did take place at the Fall Classic. This was the first game Wednesday (9/22) morning at the TEC (Sioux Falls vs. Des Moines). I was sitting about 12 rows up from where this happened, so I had a fantastic view of it. I couldn't believe it when it happened. 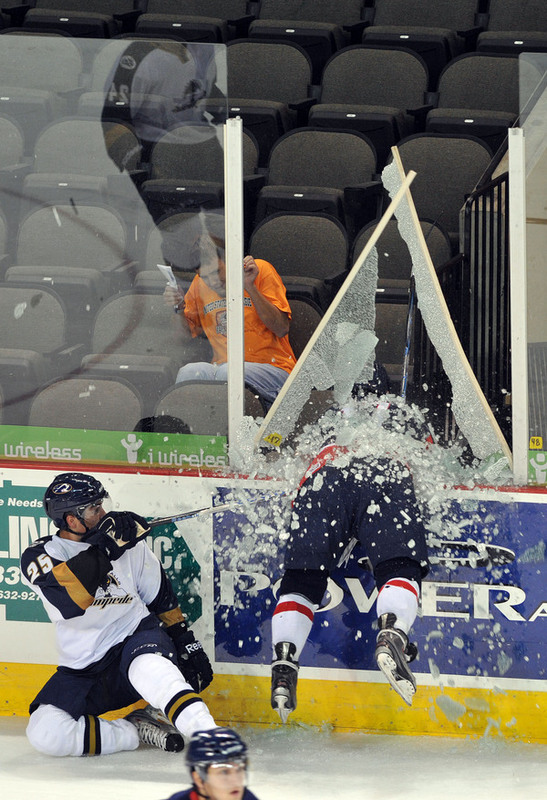 According to the Des Moines Bucs twitter page, this photo was taken by the DM team photographer, Bryce Loshman. Fantastic shot. Anyway, just thought I'd share. Neither of the two players pictured were injured. Love the expression of the fan wearing the orange shirt. Priceless. Blog reader "Crazy Carl" was along the glass, just to the left of this and got some pictures also. It must have been an hour delay to clean up all of the glass, and put the new panel in. Glad that no one was hurt, but it was awesome to watch live.